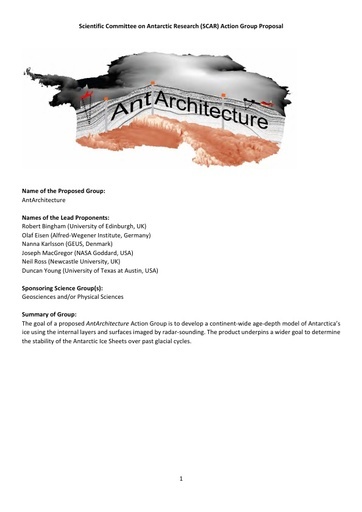 Proposal for the establishment of an AntArchitecture Action Group, jointly sponsored by the Geosciences and Physical Sciences Groups, to determine the stability of the Antarctic ice sheets directly from the internal architecture of the ice. The goal of a proposed AntArchitecture Action Group is to develop a continent‐wide, age‐depth model of Antarctica’s ice using the internal layers and surfaces imaged by radar‐sounding. The product underpins a wider goal to determine the stability of the Antarctic Ice Sheets over past glacial cycles.